Adjunto información solicitada por el mal funcionamiento del anticuerpo ab1416. Muchas gracias por enviarnos el cuestionario relleno con la información del anticuerpo. Siento que el anticuerpo no haya dado los resultados esperados en ninguna de las técnicas utilizadas, y espero poder ayudar a su optimización. En caso contrario, si estuviera el anticuerpo aun bajo garantía, le enviaríamos un reemplazo del mismo o un reembolso del importe invertido. Le pediría por favor que nos mandara en número de pedido con el que se adquirió el anticuerpo, y si fuera posible una o varias imágenes de los resultados obtenidos con él. De esta manera nos ayudara mejor a comprender los resultados inesperados. - Nosotros solemos recomendar utilizar RIPA como buffer de lisis, por tener un mayor poder desnaturalizante que otros buffers. -No se menciona el agente de bloqueo usado para bloquear uniones inespecíficas de la membrana. Para este anticuerpo se ha comprobado que el uso de leche al 5% durante 1 hora da buenos resultados. - Si tienen ocasión usar tejido de carcinoma de mama como control positivo. Espero que estas sugerencias mejoren el rendimiento del anticuerpo. De no ser así, no dude en contactarme de nuevo. A clone number is given to an antibody produced by a single clone of hybridoma cells. Each hybridoma cell clone produces one single pure homogeneous type of antibody. The term "monoclonal" pertains to a single clone of cells, a single cell and the progeny of that cell. Monoclonal antibodies can be made in large amounts in the laboratory. Each clone number represents a specific cell line cloned from ascites that was used to manufacture the antibody. Since antibodies are produced by more than one host, each cloned cell line receives a unique clone number. The clone number is not synonymous with the lot number which is in relation with the creation of the vial. There is little to no difference amongst the quality of the clones therefore, any of these 3 antibodies would work for your purposes in WB and ICC in Human. 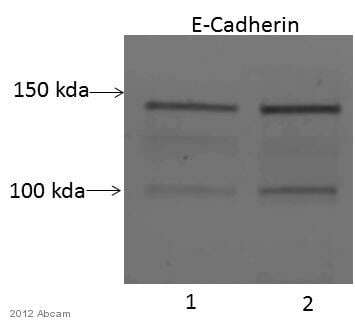 I would however recommend ab1416 out of the three antibodies since we have had lots of postive customer reviews when using this antibody in ICC and WB. In attachment you can find the answers to the questions. Thank you very much for taking the time to complete our questionnaire and sending the image. - In order to obtain a clearer blot ensuring denaturing / reducing conditions is crucial. For that, use RIPA buffer as it has a high denaturing level than the buffer used. -Run a no primary control to make sure the unspecific bands do not correspond to the secondary, and use more diluted secondary (1/5000). 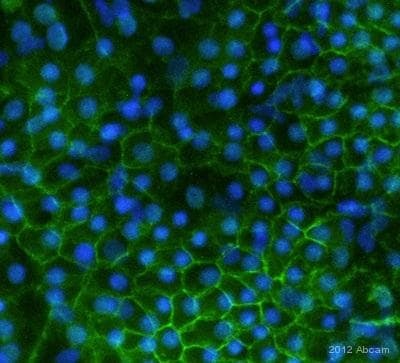 - The use of a positive control is a good indicator of the antibody’s performance. For this particular case, Breast Cancer lysates are recommended as positive control. All of our products are covered by our Abpromise guarantee; which ensures that you can trust our products, and they should work in the tested species and applications stated on the datasheet, or we will offer a replacement, credit, or refund, if reported within 6 months of purchase. Could you please provide the purchase order number? I hope these tips help, thank you for your cooperation. Should the suggestions not improve the results, please do not hesitate to contact me again and I’ll be more than happy to help you further. I am sorry to hear you are experiencing difficulties with our products. It is very difficult for us to understand the problem without further details. In order to monitor the product’s quality, and better understand the problem, I would appreciate if you could please send us the attached questionnaire completed. It only takes about 5 minutes to fill out; any images would also be very helpful. All of our products are covered by our Abpromise® guarantee, which ensures that you can trust our products, and they should work in the tested species and applications stated on the datasheet, or we will offer a replacement, credit, or refund, if reported within 6 months of purchase. I look forward to receiving your reply. Please do not hesitate to contact us if you need any more advice or information.